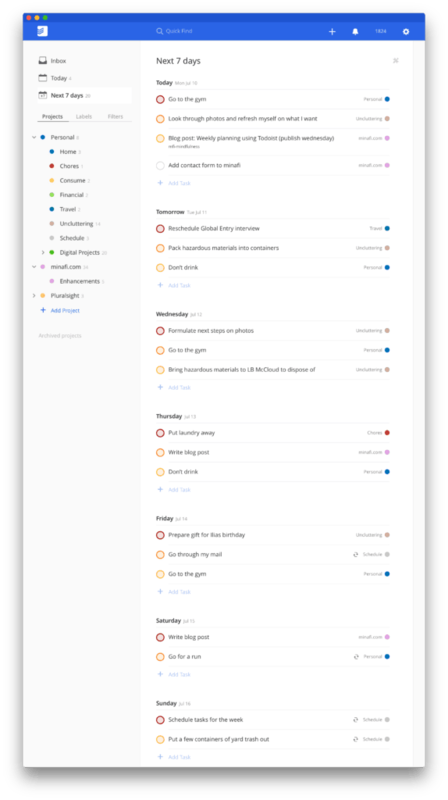 A look into how I schedule my tasks for the week using Todoist while keeping in mind monthly and yearly goals. After years of using this system I still go back to it. Written by Adam on July 12, 2017. Updated April 25, 2019. 4 min read. Goals, Mindfulness. 3 comments. I’ve written about how I set Yearly Goals and Monthly Goals before, but not about the small steps I personally use to actually get there. For me, the goals add a huge level of focus that helps me understand what I should prioritize in the next week. Every Sunday I plan out my tasks for the next 7 days. During this time I’ll I pull up my monthly goals and review them to understand what I should be working towards. 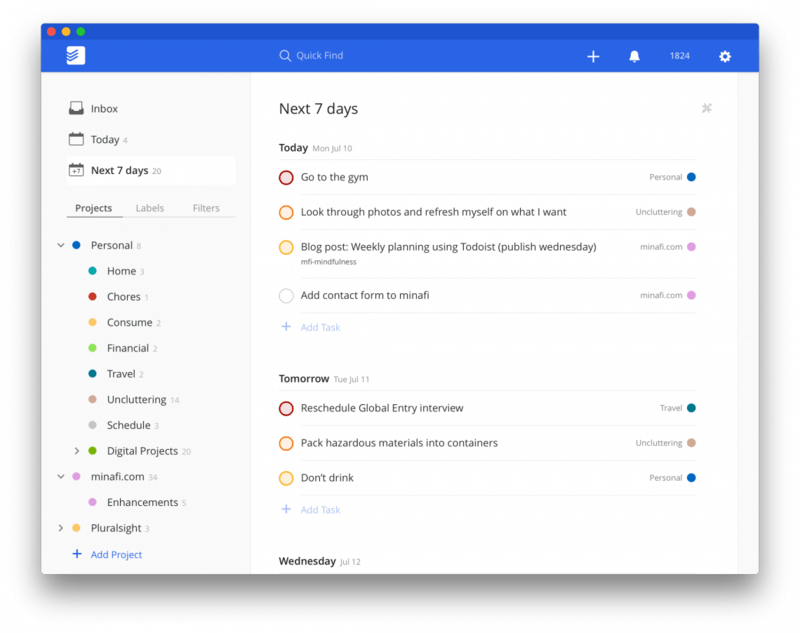 Next, I’ll open up Todoist, my todo list of choice and set it to the “Next 7 Days View”. This view is amazing since it lets you see your week in a single glance. This is the only time during the week when I use this view, but it helps me line up everything that I think is important for the next 7 days. A high priority task, indicating that if I do nothing else that day, I should do that. A medium priority task, which is the next focus when I finish the first one. A low priority task to work on at some point during the day. The goal is to make it through all 3 of these tasks every day. As you complete them throughout the day, check them off. There is also strategy involved in not placing too many time-intensive things on the same day, or on back to back days. One tricky part is working around the rest of my life. If I have evening plans one night come up, that could throw off the schedule quite a bit. Letting these tasks be flexible has been important for me, but also holding myself accountable for delivering on them when I can. After everything is entered in, the week will look something like this. Other tasks will work their way in throughout the day as well. I usually don’t prioritize these unless they need to be accomplished that day. Otherwise, I’ll do my best to accomplish them throughout the day. That doesn’t happen for me yet, but I’m slowly getting better at it. What’s been helpful so far is taking 5 minutes at the end of the night right before I go to sleep to look at what’s left over and decide where to move it. This helps me know what to focus on when I wake up in the morning. If I can get up and have a few minutes to knock out one of the things on this list before heading in to work, that’s an amazing way to start the day. Making that decision happens the night before, as opposed to the morning of. For instance — going to the gym. I’ll set an alarm and work it into my schedule that day. The same works for other things on this list. How Do You Plan Your Tasks? This is what’s worked for me lately, but I’m sure it’ll evolve over time. The combination of a monthly list of things to accomplish with individual daily tasks has been a great mix of a “what”, a “how” and a “why” for getting something done. For those that use other planning methods for accomplishing your goals, what does your process look like? Editors note: There is a task on Tuesday called “pack hazardous materials into containers” lol. I’ve been cleaning out my garage, and am preparing to take old paint, cleaning materials, and others to a hazardous waste site here in Orlando. Nothing to worry about on that one — I promise. Seeing it all in one place for the week seems like a commonality from both our methods. Feels a lot more productive than trying to choose things every night. We coudl’ve done with that insight early on.